“At AML Foods we are committed to supporting and making a positive impact in the communities in which we operate,” said Renea Bastian, AML Marketing Dept. “The Grand Bahama Children’s Home stands out as a beacon of hope for disadvantaged children and we are delighted to be able to support them in this way. 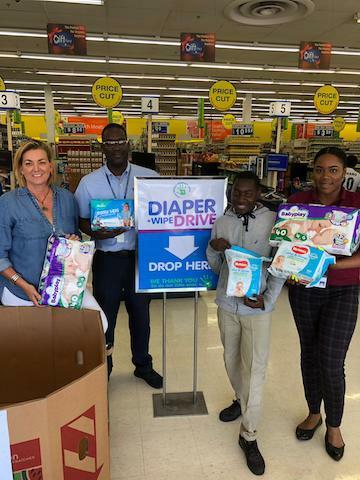 The initiative, which launched on Friday, encourages customers to purchase diapers or wipes for the Home at Cost Right Freeport, Solomon’s Lucaya or Solomon’s Queen’s Highway. After purchase, customers can place the items in special marked bins located in the stores. AML has pledged to match each purchase of diapers or wipes, and donate all the items to the Home. GBCH Executive Committee Member, Sarah Kirkby, is appreciative of the out-pouring of concern generated by the social media post, and is thankful to AML for assisting the home. “AML is relieving a heavy burden for us right now,” said Kirkby. “We have quite a few babies in the home right now, as well as some young children who are mentally and physically challenged, and hence the increased need for diapers and wipes. AML Foods joins other corporate companies on Grand Bahama that have come forward to lend a helping hand to the home. Telecommunications company Aliv, was the first company to respond to the social media plea for diapers and wipes, but more support is welcomed. “We welcome all support, whether Corporate or personal,” said Kirkby. “Our home is like any other, we have power bills, water bills, maintenance, and food costs times 26.